A well managed horse breeding program should begin with the desired result in mind, and then select the best individuals of the breeds to attain that result. Deb's goal was to breed Friesian Sporthorses that would be easy and fun to work with and having the qualities to be successful as sport horses, with a tendency toward Dressage. Deb DeVries draws on more than 30 years of experience as a professional equestrian in establishing her breeding program. Deb has ridden with some of the top dressage instructors in the United States. She trains horses in the art of dressage and has an extensive show history. Deb successfully completed the Dressage L judge program and is available to judge dressage schooling shows. Deb works with Pony Club and other horse groups, instructing groups and individuals. Through these experiences, she is highly qualified to evaluate the conformation, temperament and athleticism required for a horse to be successful in competition. It happens when you breed for a specific type of horse with a specific use for it's future, preferably something other than breeding more horses. I made a decision long ago that I would never own or breed a horse that had no use. If the horse couldn't be ridden or driven, it won't be bred either. A serious injury to an otherwise well-bred horse does not mean it couldn't be bred but there needs to be a purpose for that foal in life, other than making more horses with the hope of selling them at a profit. With that purpose in mind we have bred horses from top performance bloodlines and proven trainability and temperaments to produce what we think are some of the best looking, most trainable horses in the country. We bred for size that is competitive in the sport horse arenas and conformation to keep them sound for a long, successful life. These are not the horses that you sell when you are done with them, Friesian personalities are so loving and committed that selling them is not an option once you have fallen for one. By crossing the Friesian we have been able to dilute the hundreds of years of inbreeding instantly and virtually erased the inherited sensitivities that have plagued the breed for years while retaining the wonderful conformation and personalities that make us love them so much. Careful cross breeding to create use-able horses is paramount in this country due to the overwhelming over population of horses. BUYERS need to demand better, more than just a pretty color and some extra hair. Athletic ability, train-ability and temperament are more important that what it looks like on the outside. Check out conformation, look past the hair coat on the outside! If a mare/stallion has proven themselves as a good rideable/trainable horse and has a pedigree of similar horses, more than likely the resulting foal will match or even exceed the parents. If a mare is no longer rideable because of lameness or bad attitude, why would any responsible breeder breed another horse that is likely to become lame and/or has a nasty disposition? You've heard papers don't matter - WRONG! They give the horse a history, and that history tells you something. Besides a permanent record of age, it lists the lineage, which gives you insight into what the horse may have originally been bred to do. If you breed with the horse's inherited tendencies and abilities in mind, you will more likely get the result you expect. Deb worked at a prominent Morgan breeding barn in Wisconsin and became familiar with the breed qualities, abilities and bloodlines. Deb DeVries selected the Friesian Ster Stallion Phantom of Noble (Pedigree) as the basis of her breeding program. Phantom has been approved for provisional breeding following the FSA inspection in August 2014. He has the bloodlines to produce champions. 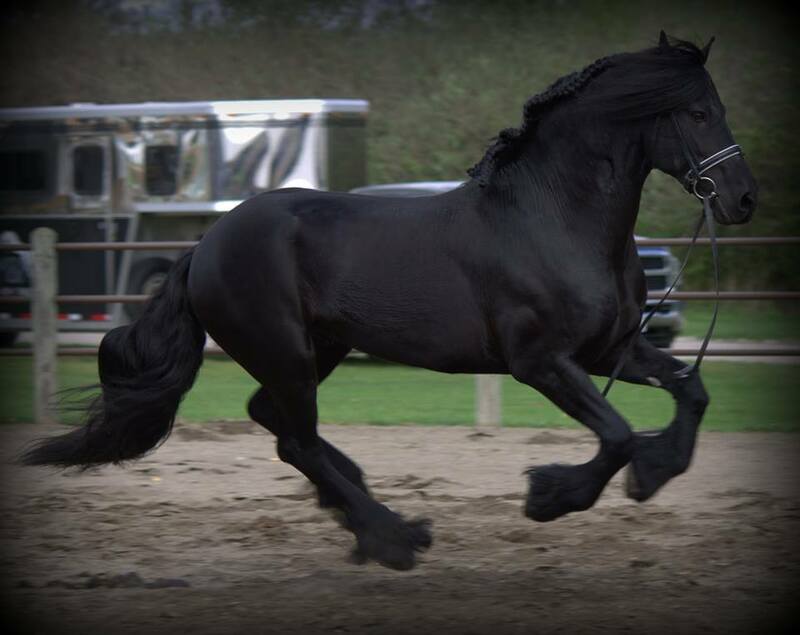 Well-bred Friesian Sporthorses are lovely horses, combining the beauty, temperament, and expressive gaits of the Friesian. 2017 Breeding Special! 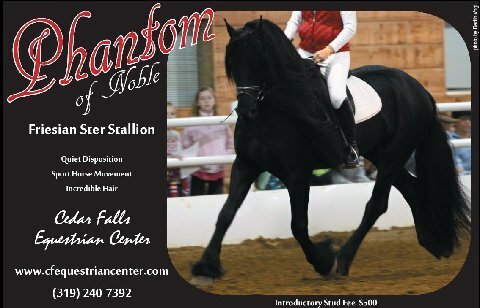 Discounts for FSA approved mares, discounts for FSA registered mares and a rebate when your Phantom foal attends an FSA inspection! All board, vet and other fees are the responsibility of the mare owner. We had a very successful weekend at the Friesian Sporthorse Inspection 2014 in Grinnell, Iowa. There were a total of 20 horses entered and final scores ranged from 71-76%. Three stallions were presented and one stallion (Phantom of Noble) received Full Breeding Approval. All horses presented earned their Bronze Elite status via inspection. © Copyright Cedar Falls Equestrian Center. Contact cfeconline@gmail.com or call 319-240-7392.